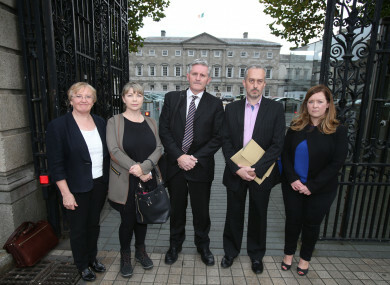 Victims of the tracker mortgage scandal, accompanied by financial advisor Padraig Kissane (centre), told their stories to the Oireachtas Finance Committee earlier this year. THE CENTRAL BANK has confirmed that the number of customers overcharged by their banks as a result of the tracker mortgage scandal has risen to 33,700. The scandal saw thousands of people being either denied a tracker rate when they were entitled to one, or charged the wrong rate of interest on their tracker. These errors by all of the main banks in Ireland led to overcharging of tens of thousands for some families. In the most extreme cases, people lost their homes. In an update on its examination today, the Central Bank said the total figure included 26,600 customers in the current examination and 7,100 cases outside of it. It also said it had to push lenders to accept some 13,600 of these customers as impacted. “Many lenders publicly state that they put customers first. The evidence of the Examination that we have seen suggests otherwise. The Central Bank recognises the devastating effects that lenders’ failures have had on families and individuals,” Central Bank governor Philip Lane said. That is why we’re using all our powers to force the banks into line and ensure all affected customers are included for redress and compensation. The Central Bank’s director general of financial conduct Derville Rowland said many of the banks “put up barriers by relying on legalistic approaches and narrow interpretations of contracts”. We relentlessly pursued them in order to force them into doing the right thing by their customers. While the Central Bank’s view is that the vast majority of customers have now been identified and included for redress and compensation, we will continue to review, challenge and verify the work undertaken by the lenders and complete our intrusive on-site inspection programme. So far, €297 million in redress and compensation has been paid and the majority of customers identified by the end of September have received redress and compensation. The Central Bank said the number of customers getting their money back and receiving compensation will increase over the coming weeks and months. It also said that the examination has been designed to ensure affected customers have further options if they believe what they are being offered by their lenders is not sufficient. “It is important to note that customers can accept the redress and compensation offered and still make an appeal – they can ‘cash the cheque’ safe in the knowledge that what they have, they hold. Redress and compensation offers cannot be reduced if a customer makes an appeal,” Lane said. Three enforcement investigations are currently in train and the Central Bank expects investigations into all of the main banks over the scandal. Email “It gets worse: Central Bank forces lenders to admit 13,600 more tracker victims overcharged”. Feedback on “It gets worse: Central Bank forces lenders to admit 13,600 more tracker victims overcharged”.